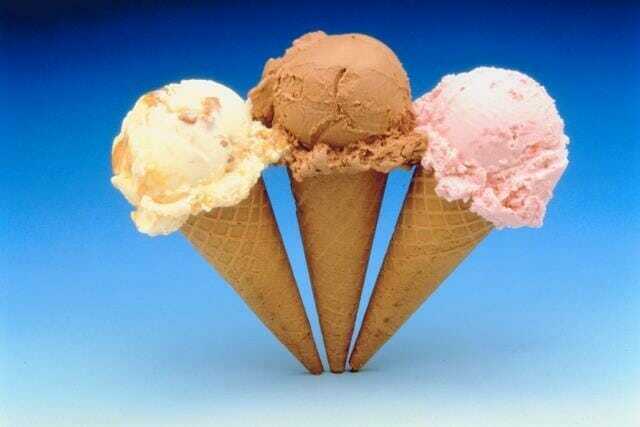 Only within the past 60 to 70 years has ice cream become a staple of the American diet. Thanks to freezer technology and a penchant for the sweeter things in life, ice cream has come a long way since its Chinese origins. Back then, King T’ang (of the T’ang dynasty A.D. 618-907) kept “ice men” in the palace. These “ice men” would then take huge blocks of ice and mix them with heated, fermented milk, flour and camphor to make an ice cream dish suited for a king. The first written account of ice cream in America appears courtesy of a Scottish colonist who dined at the house of Maryland Governor Thomas Bladen. He described “a dessert…Among the Rarities of which is was Compos’d, was some fine Ice Cream which, with the Strawberries and Milk, eat most deliciously.” And ice cream’s popularity has only grown since. In World War II, the first floating ice cream parlor was developed for the troops serving in the West Pacific, and since ice cream was considered such an American symbol, Mussolini banned it in Italy. Can you imagine Italy without gelato? Luckily, ice cream is widely available today (practically everywhere, even the best places to retire) and consumption in the U.S. alone totals more than 1.6 billion gallons, and the month of July has been named National Ice Cream Month. While grocery stores brands have diverse flavors, it’s easy to make your own ice cream. Just recently, Melissa Clark released “The Master Ice Cream Recipe” in The New York Times, which is a recipe for an ice cream base that allows you to customize the flavoring. In the article, Clark provides a handy chart for figuring out just which flavors go well together, but traditional chocolate is always a hit. 1. In a small pot, simmer cream, milk, sugar and salt until sugar completely dissolves, about 5 minutes. Remove pot from heat. In a separate bowl, whisk yolks. Whisking constantly, slowly whisk about a third of the hot cream into the yolks, then whisk the yolk mixture back into the pot with the cream. Return pot to medium-low heat and gently cook until mixture is thick enough to coat the back of a spoon (about 170 degrees on an instant-read thermometer). 2. Strain through a fine-mesh sieve into a bowl. Cool mixture to room temperature. Cover and chill at least 4 hours or overnight. 3. Churn in an ice cream machine according to manufacturer’s instructions. Serve directly from the machine for soft serve, or store in freezer until needed.